3.5 As I've mentioned before, it seems that books follow a trend. Either that or I am just randomly encountering books that make it seem that way. So trend or not, I am enjoying the many books that I have read lately, that contain a folklore or myth of some kind. Just love all those old stories containing people and places, old beliefs and warnings. This book that I enjoyed also contains such a story. Set on Lake Superior this a a good story, very atmospher. Old house, fog, mist, with elements of 3.5 As I've mentioned before, it seems that books follow a trend. Either that or I am just randomly encountering books that make it seem that way. So trend or not, I am enjoying the many books that I have read lately, that contain a folklore or myth of some kind. Just love all those old stories containing people and places, old beliefs and warnings. This book that I enjoyed also contains such a story. Set on Lake Superior this a a good story, very atmospher. Old house, fog, mist, with elements of the paranormal, a talent of reading dreams passed down through generations. The timeline is one hundred years apart, and now an event, needs to be understood and corrected in the present. Of course the lake plays a big part of the story, in fact in this book it is where it begins. "The Lakeshore was magical was magical then, in those days, and so it remained. But people had grown to noisy, too preoccupied, too sophisticated to listen to its song." To understand what happened in the past, Kate our main character, must learn more about the past, her own family heritage. The spirits of the past are waiting for her to connect the dots and bring peace and the truth to the forefront. Don't believe in spirits? Maybe were just not listening hard enough in our now too noisy world. A wonderful historical fiction with mystery, tragedy, ghosts of loves and lives lost and ultimately redemtion of a families past that has been hidden for so long. I enjoyed how the story was interwoven with the past and present. The characters were all well placed, I liked them all. A very enjoyable read for me. I am so sad to say that I found this one disappointing. When I saw the cover it was love at first sight and the synopsis was very intriguing. Sadly, that is where my enjoyment ends. This book is a slow burn. Very slow. I started skimming even before hitting the 20% mark. That is never a good sign. I found because of the slow pace I just couldn't become invested in the *multiple* (too many) characters. Also, the ending fell completely flat for me. I can suspend disbelief but not to that extent. I I am so sad to say that I found this one disappointing. I'm an outlier so if you are a fan of the author or love slow gothic romance / mystery with little in the way of suspense then this may be a perfect read for you. Sorry, but no matter how much I enjoyed The End of Temperance Dare couldn't I muster interest enough to finish this book. The story is so... saccharine and honestly boring. I have to admit that I was quite taken with the cover and the blurb intrigued me. But, it's just romance all the way. The murder mystery? Zzzz well it's much more important that the MC had a vision of her romancing the cop that takes over the case. A haunting tale with gothic undertones...mesmerizing and superbly written! The story is told in past and present. The past portion takes place in the late 1800’s and early 1900’s. And even though this story deals with the paranormal, it is not a horror story. The portion told in the past is the love story of Jess and Addie...both beautiful and tragic. It’s laced with ghosts and hauntings. And it is full of legend, lore and mysterious family secrets. The present deals with Kate and her connection to the past. A lot of the story takes place at the Harrison’s House B&B, which is part of Kate’s family heritage, and is run by her cousin Simon. He is a hoot and one of the funniest characters I’ve read about in a long time! He added so much to the story. I absolutely love old houses, antiques and digging through old “treasures” and heirlooms... so when the author described the Harrison’s House B&B, with all its family photos, portraits and antique furnishings...plus the trunks full of “treasures” stowed away in the attic...I was literally drooling! I wanted to jump in the book and help dig in those trunks SO BAD. Although I predicted parted of the ending, the story was so elegantly written, it was never dull or uninteresting...and there was a final twist that took me by surprise! Wendy Webb is another new author for me, and one I will watch for in the future. Thank you to NetGalley / Lake Union Publishing / Wendy Webb for this digital ARC / in exchange for my honest review! 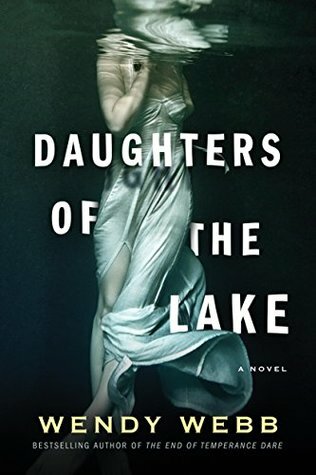 When I decided to read spooky books for October, I already had the hauntingly beautiful cover art of Wendy Webb’s Daughters of the Lake in mind. Billed as a Gothic masterpiece with elements of historical fiction and the supernatural, Daughters tells the story of a family with a unique past, interesting local legends and a century old murder. “It was finally time for the lake to give her up” reads the first sentence of this book. Effortless and evocative, I was disappointed to find that most of th When I decided to read spooky books for October, I already had the hauntingly beautiful cover art of Wendy Webb’s Daughters of the Lake in mind. Billed as a Gothic masterpiece with elements of historical fiction and the supernatural, Daughters tells the story of a family with a unique past, interesting local legends and a century old murder. “It was finally time for the lake to give her up” reads the first sentence of this book. Effortless and evocative, I was disappointed to find that most of the rest of this novel lacked the nuance of the opener. At times, Webb seemed overly descriptive yet repetitive with her descriptors to the point that I had to consider that it must be some sort of literary device. Silky, velvety, silky, velvety, silky, velvety… you get the picture. However, even a broken clock is right twice a day, and there were a few lines so eerie I get goose bumps just thinking about them. Genuinely, I feel that the *idea* of the story was amazing. The living lake felt like something Neil Gaiman would dream up, and the living portrait almost brought the book into magical realism territory. The murder plot, while occasionally predictable, was woven seamlessly through the multiple point-of-view chapters. Remarkably, the creep factor was high throughout the narrative without ever stooping to gore. I'm so glad I chose this book from the Amazon Kindle free book for the month! At first I had my doubts, I usually don't go for haunted houses, ghosts, and things like that, but this is quite a detailed and intense novel. I enjoyed reading the way the author had it sectioned chapter by chapter, going from the past (1901) to the current times - and the main character was a suspect in a murder that, she found, was committed 100 years before when a perfectly preserved body of a victorian woman and h I'm so glad I chose this book from the Amazon Kindle free book for the month! At first I had my doubts, I usually don't go for haunted houses, ghosts, and things like that, but this is quite a detailed and intense novel. I enjoyed reading the way the author had it sectioned chapter by chapter, going from the past (1901) to the current times - and the main character was a suspect in a murder that, she found, was committed 100 years before when a perfectly preserved body of a victorian woman and her baby washed up on shore. This was not your regular Casper the Ghost type of story. This was a true mystery that really has the wheels turning in the reader's mind! Plus it keeps you on edge up to the last page. What an awesome book! Wendy Webb - WENDY WEBB's novels are mysteries about long-buried family secrets, set in big, old haunted houses on the Great Lakes. THE END OF TEMPERANCE DARE (2017, Lake Union) is set in a former tuberculosis sanatorium on Lake Superior, now a renowned retreat for artists and writers. When Eleanor Harper takes the helm as its new director and her first batch of visiting artists arrives, she begins to suspect this isn't going to be the restful retreat she thought it might be. THE VANISHING (2014, Hyperion) is the story of Julia Bishop, who takes a job as a companion for a famous novelist, who the entire world thinks is dead. When she travels to the novelist's remote estate, she begins to suspect her too-good-to-be-true job offer is exactly that. THE FATE OF MERCY ALBAN (2013, Hyperion) is an Indie bestseller. It's the story of Grace Alban, who returns home after 20 years when her mother dies under questionable circumstances on the very day she (the mother) planned to reveal the truth about a tragedy that occurred during a party at Alban House long ago. A packet of old love letters and a lost manuscript by a famous novelist lead Grace to the haunted truth about what really happened that day. Wendy's first novel, THE TALE OF HALCYON CRANE (2010, Holt) was an IndieNext Pick, a Great Lakes Great Reads Pick and a Midwest Connections Pick. It won the prestigious Minnesota Book Award for genre fiction in 2011, and was a finalist for Le Livre de Poche's Prix des Lecteurs award in France in 2012.